The Callaway Apex CF16 irons were designed with Cup 360 technology that gives you exceptional, consistent ball speeds across the whole face and playability in a forged players iron. They feature a progressive design to create scoring performance from the long irons to the short irons and the multi-piece construction provides the perfect combination of feel, control and distance. The quadruple net forging process along with the carbon steel material provides an extremely soft feel. With its classic, authentic shape and advanced technologies, the Apex CF16 iron is the perfect forged iron for all golfers. 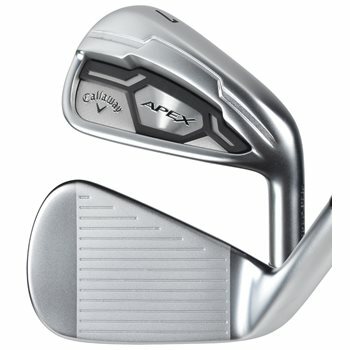 The bargain apex c16 reg graphite iron set. How bad shape? Do they need regroups? Are there any coupons as it sounds like a gamble? A stiff shaft usually works best with driver head speed from 95-105 mph. F3 is listed as regular flex, F4 is stiff. Which KBS shaft is in this set? as soon as i get clarification on shaft .. F2 or F3 and confirmation that these clubs are in fact CF 16 as identified on the hozel i am prepared to go ahead with purchase but must receive delivery by April 5th at the latest..... confused as to you question and answer process ? ?